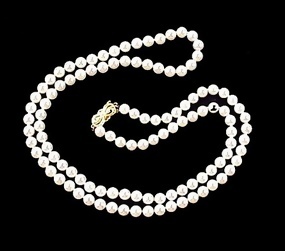 Beautiful 29.75” strand of pearls by Mikimoto. The 6.0-6.5mm pearls are joined with a 14K yellow gold clasp set with a 3.3mm pearl. The strand comprises 113 pearls having medium cream-rose body color with Mikimoto’s classic rosé overtones. The nacre is thick and the luster is very fine. The quality is appraised at fine AA, indicating that they just border on the elusive AAA quality. The clasp is marked with Mikimoto’s hallmark. The strand is presented in its original white satin folio marked "Mikimoto Fifth Avenue". Origin: Japan, ca. 1980. Condition: excellent, securely strung; the satin folio has a champagne stain in the interior. Size: 29.75”, 6.0-6.5mm. Accompanied by a June 2005 Bailey, Banks & Biddle written appraisal for $6,500.